The 134th ASA Annual Meeting was held at The Marriott Copley Place Hotel in Boston, Massachusetts, with 637 physicians and 125 spouses and guests in attendance. Thirty-two (32) outstanding papers were presented during the Scientific Sessions of the 2014 Meeting. During the Opening Ceremony, seven new Honorary Fellows were introduced: Professor Claudio Bassi of Verona, Italy; Dr. Hoon Sang Chi of Seoul, Korea; Lord Ara Darzi of London, England; Professor Alberto Ferreres of Buenos Aires, Argentina; Professor Richard John (Bill) Heald of Hampshire, United Kingdom; Dr. Ari Leppäneimi of Helsinki, Finland; and Professor Pascual Parrilla of Murcia, Spain. 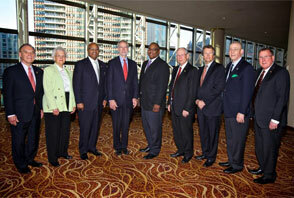 These seven new members were greeted with a warm welcome by the ASA meeting audience. The Medallion for Scientific Achievement was awarded to Dr. David N. Herndon of the University of Texas Medical Branch, Galveston, Texas. The Medallion for Scientific Achievement is given periodically to a surgeon who has served his field with unusual distinction. The Medallion for the Advancement of Surgical Care was awarded posthumously to Dr. Donald L. Morton of the John Wayne Cancer Institute, Santa Monica, California. Ms. Christin Kazmierczak accepted the Medallion on behalf of her late father. The Medallion for the Advancement of Surgical Care recognizes seminal contributions in clinical surgery or surgical education that truly established new benchmarks or paradigms. These medallions represent the highest awards bestowed by the Association. A highlight of Thursday’s program was Dr. Layton Rikkers’ Presidential Address, "The History of Communication". Programming on Friday featured the enlightening Forum Discussion, "Quality: The Key to Surgery's Future", moderated by Dr. Rikkers, which included presentations from Dr. David Hoyt, Executive Director of the American College of Surgeons, Dr. David R. Flum, University of Washington, and Dr. Mark Malangoni, Associate Executive Director of the American Board of Surgery. At the Executive Session on Friday, the Flance-Karl Award was presented to Dr. Christian P. Larsen of Emory University, Atlanta, Georgia. The Flance-Karl Award is given to recognize outstanding basic science contributions by surgeons who have reached maturity to the degree that they have had an important impact on clinical practice. In addition, update reports were given by ASAF Fellowship recipients, Dr. Ryan C. Fields of Washington University School of Medicine, Dr. James Mezhir from the University of Iowa Hospitals and Clinics, and Dr. Sunil Singhal from the University of Pennsylvania. The Foundation also named three new Fellowship recipients in 2014: Dr. Daniel S. Eiferman from Ohio State University for his project entitled, "Attenuation of Neuroinflammation by Methylene Blue Intervention in a Mouse Model of Traumatic Brain Injury"; Dr. Karin M. Hardiman from the University of Michigan for her project entitled, "Molecular Approaches to Improving Rectal Cancer Care"; and Dr. Shirling Tsai from the University of Texas Southwestern Medical Center, for her project entitled, "Control of TGF-Beta Signaling by LRP1 in the Pathogenesis of Aortic Aneurysms". A bylaw amendment was passed establishing the Professional & Ethics Committee as a standing committee rather than an ad hoc committee. The Committee shall convene as requested by the Council to research allegations of unethical or unprofessional behavior by Fellows and recommend to Council appropriate disciplinary action, which may include termination of Fellowship. As a premier academic society for surgeons, the American Surgical Association will always strive to benefit the patient and the profession of surgery by advocating and promoting excellence, innovation, and integrity in science, education, and patient care. Reaffirmed adherence to the Association's attendance requirement, as stated in the ASA's By-Laws: "Fellowship shall be terminated in the event that an Active Fellow is absent from three (3) consecutive meetings without submitting adequate excuse to the Secretary, in writing." Furthermore, Council recommended that Fellows should not wait until the third year to fulfill the attendance requirement should an unexpected issue arise in that third year, and that members requesting an excused absence in year three should provide the reasons for missing the prior two meetings as well. Regarding the ACS/ASA Health Policy and Management Scholarship for the Executive Leadership Program at Brandeis University: reaffirmed the value of the program; recommended that minority status and gender be considered in the future selection of sponsored scholars; and agreed to maintain an ad hoc group of previous ASA scholars to make recommendations to Council, as required. Approved the production of new gold-toned lapel pins for Samuel D. Gross-level Foundation donors to distinguish them from those who receive/purchase the silver-toned lapel pin. Adopted an Embargo Policy, whereby any news media activities on Annual Meeting studies and their associated abstracts are restricted until the date and time of each individual scientific presentation. Agreed to implement an ad hoc committee to assist Chairs in developing and maintaining young surgeon-scientists. Agreed to continue the exchange program with the French Academy of Surgery, with the ASA hosting in odd-numbered years at U.S. institutions near the city of the ACS Clinical Congress, and to make the selection of ASA Fellows to participate abroad a competitive process, with members nominating themselves for consideration. Concurred that, since only Invited Discussants are required in advance of the Annual Meeting to disclose financial relationships with any commercial interest that are relevant to the paper on which they are commenting, all non-invited discussants who ask questions at the meeting be advised to disclose verbally financial relationships relevant to the paper they are about to discuss. Voted to induct six new Honorary Fellows into the Association, who were introduced at the 2014 opening session along with 1 Honorary Fellow approved in 2012. Adopted a policy whereby, if a memorial statement is unable to be secured within six months of the Association’s receiving word of a member's passing, then the Recorder may proceed with writing the memoir, based on information that is readily available. Clarified that ASA Fellows within the United States and Canada of any surgical specialty are eligible to be considered for the Flance-Karl Award. Adopted a policy of sending a short notice to the membership of a Fellow's passing, but only when the ASA learns of a Fellow's death within two months of the actual occurrence. Discussed the ramifications of the unification of the Allopathic and Osteopathic Accreditation Processes. The American Surgical Association has fostered advancement in surgical procedures for over 130 years. Research and education programs are paramount to maintaining and even accelerating these advances in the years ahead. Over thirty years ago the ASA established the American Surgical Association Foundation to serve as the ASA's fund raising arm and, more importantly, ensure that our research award programs would have the financial wherewithal to support new and exciting initiatives that would lead to further advancements. Thanks to the generous support of the ASA members, the Foundation has built an impressive record of accomplishment and has accelerated its levels of research since its founding. Since 1982, the Foundation has awarded 49 Research Fellowships to truly gifted surgeon-scientists. Many of these recipients have been elected to ASA membership. All have received peer-reviewed funding. Their academic and professional accomplishments have been impressive. Our return on investment in these surgeon-scientists has been significant. 2015-2017 Recipients to be announced this fall! The 2016 membership is open and new candidate applications may be initiated by current ASA Active and Senior Fellows. Each candidate's electronic membership application must be completed and submitted online by March 1, 2015. All support letters must be uploaded by a candidate's sponsors and up to three additional Fellows by March 31, 2015, in order for the applicant's name to be read at the 2015 Annual Meeting in San Diego, California. The final 2016 ballot will be presented for vote at the Annual Business Meeting in Chicago, Illinois, in April 2016. Please note that the timeline from completion of application to election at the Annual Meeting is at minimum 13 months long. It was not that long ago when American medicine was dominated by white male physicians. Now women represent approximately 51% of all medical students and 40-45% of residents in many surgical training programs. There is also increasing diversity of resident trainees in race and ethnicity. This in turn will have a positive impact on academic faculties of medicine, and in particular, surgery. The Council of the American Surgical Association feels strongly that our membership should reflect and support these changes. ASA Members are strongly encouraged to seek out members in their department who either are women or belong to other underrepresented groups and propose them for Membership. We particularly would like to admit to Membership those who will be our future leaders in American surgery. The Annals of Surgery is the official publication of the papers presented at the Scientific Sessions of the Annual Meeting of the American Surgical Association. Through a cooperative arrangement with the publisher of the Annals, members of the ASA are entitled to a 20% member discount on the annual subscription to the Annals. * Inclusive of shipping charges; for additional information on the ASA member 20% discount, please log into the Member's Only Area.